The 476 and 952 cubic foot capacity Despatch TAD/TFD walk-in ovens feature uniflow airflow to ensure uniform temperatures throughout the oven. These ovens are commonly used for pre-heating steel, metal stress-relieving and other heavy industrial heat treating processes. Maximum temperature is 343℃ (650℉). These ovens ship in just 6 weeks. 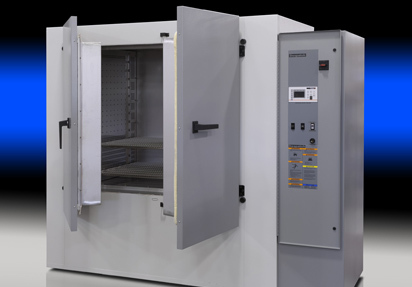 The RAD/RFD reach-in oven offers a variety of chamber sizes, features high airflow for fast heating, and is available as a Class A oven for processes involving volatiles. These ovens are commonly used for pre-heating steel, metal stress-relieving and other heavy industrial heat treating processes. RAF/RFF furnaces feature horizontal recirculating air.flow to ensure exceptional temperature uniformity of +/- 5.6℃ at 538℃. A Class A furnace is available for processes involving volatiles. Common heat treating process include annealing and aging steel, metal stress-relieving and other high temperature, heavy industrial processes. The TAD/TFD walk-in and truck-in ovens are robust for heavier industrial processes. The TFD models are Class A and meet NFPA 86 requirements for processing flammable solvents. TA models perform stress relieving for metals and plastics, steel pre-heating, aging, drying and general heat treating. The TAF/TFF walk-in and truck-in furnaces are robust for heavier industrial processes at higher temperatures. The TF models are Class A and meet NFPA 86 requirements for applications such as finish baking, bonding and those involving moisture or fume removal. TA models perform stress relieving for metals, steel pre-heating, aging, drying and general heat treating. The FCH Furnace features horizontal recirculating airflow to ensure exceptional temperature uniformity throughout the furnace. 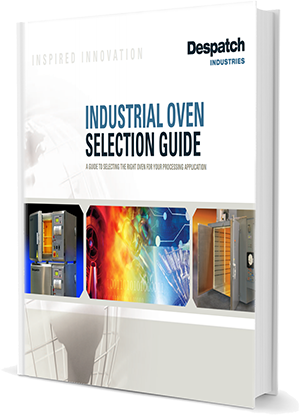 These high-performance ovens deliver temperatures up to 732℃ (1350℉) and are great for such processes as annealing, aging, drying and heat treating applications. The furnace is available in a Class A model for flammable solvents. PC Series continuous ovens are highly customizable for a variety of applications in the materials market. 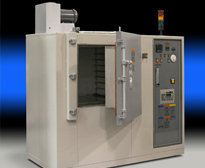 These ovens perform drying of composite materials, curing thermoset plastics and adhesives, and heat treating. The continuous belt design is ideal for large quantities of similar work pieces being processed. Heat treating is the heating and cooling of metals and alloys to achieve a desired physical and mechanical property such as strength, hardness and resistance to fatigue or failure. Heat treating is a precise science that is made more complex by the varying properties of metal alloys. Understanding the properties of the material being heat treated is critical to achieving the desired outcome. Often times multiple heat-treating steps are necessary to produce the properties required for the final product. Heat treating often requires processing at high temperatures for extended periods making energy efficiency a high priority. Despatch ovens and furnaces have thick wall insulation, heavy-duty high temperature door gaskets and air that is recirculated through the heater box and back into the chamber for greater energy efficiency. The consequence of uneven heat distribution during heat treating can be disastrous. 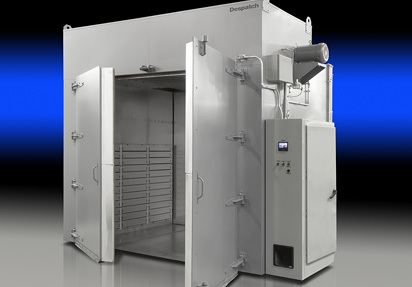 Choosing a Despatch oven or furnace will ensure you that temperature uniformity will be well within specification. 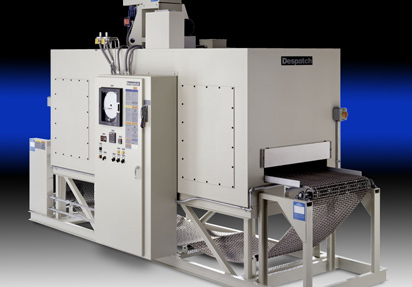 Despatch ovens feature high velocity uniflow airflow, meaning that the air moves both horizontally and vertically, offering exceptional temperature uniformity. Adjustable louvers direct heated air for a precise airflow pattern suited to specific parts. Despatch ovens are available with a gas or electric heater and are available with Class A (NFPA 86) flammable solvent handling capabilities. They are built to withstand the rigors of industrial metal manufacturing with sturdy, welded, double wall construction. Annealing produces a uniform microstructure and softens metal to improve machinability. Stress Relieving reduces internal stresses in metal caused by cold working or non-uniform cooling. Aging, also referred to as precipitation hardening increases the hardness and strength of metal alloys. 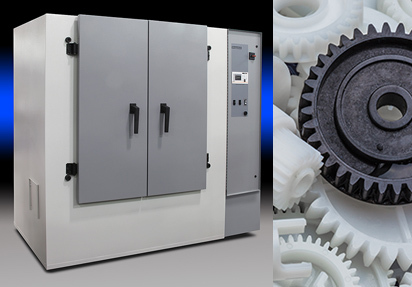 Both timing and temperature are critical during the hardening process. Uneven heating can create cracks and other defects, often starting from the corners or edges of the material. Materials that have been unevenly cooled, or soaked, can cause dark, vertical cracks that are irreparable. Tempering is a process used to reduce the brittleness and increase the tensile strength of metal alloys after hardening. 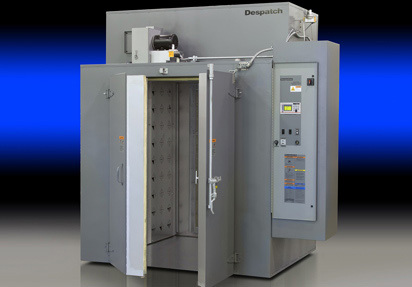 Despatch received an order for a PNF Inert Atmosphere Furnace for its beryllium copper aging process. A precondition of the order was that a test be performed to confirm that a uniformity of +/- 10℃ at 1000℃ could be maintained. A Despatch engineer was sent to the customer’s facility to perform a field nine-point temperature uniformity test on the Despatch furnace currently in use. The oven was programmed to ramp and soak at three different temperatures and data collected.Â The furnace performed even better than expected with temperature uniformity between +/- 4.3℃ and 6.8℃ (2.4℉ and 3.8℉). The furnace is designed with adjustable recirculating air louvers that allow fine tuning to ensure uniform airflow.